Due to what Diana Totten consultant on the Dobbyn’s Creek slide called “heroic acts” by the equipment operator of GE Construction, the slide has been opened enough that water is pouring through and the recently formed “lake” has dropped four feet today. The equipment operator climbed atop the still moving slide and pulled enough timber out of the way in order to allow water to break through. 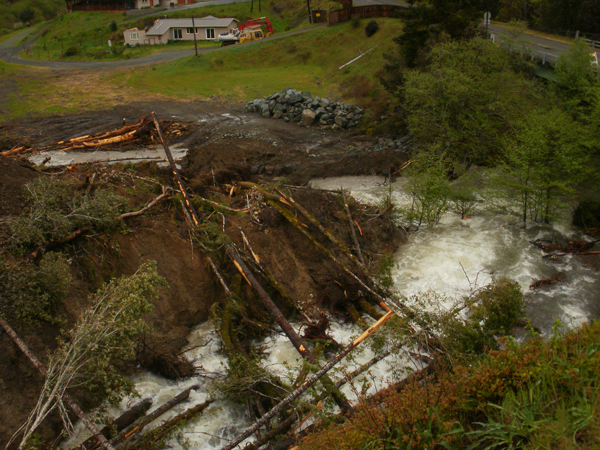 Unless there is a “big surprise” says Totten, the slide will continue to erode and let water through, reducing the chance of any damage to nearby homes, the county bridge or the road. She is concerned also about changing the way our community deals with slides. She thinks we need to start pouring the resources into helping private landowners and public entities cope with what the changing landscape. We need to ask ourselves, she said, “…being SoHum residents, is this going to be a continuing event? Will we have more next year? If so, how do we deal with it next time?…Can we be more proactive and deal with the impact to owners?” Because, she adds, this could happen to anybody. One day someone is fine. The next day they have a slide threatening their home. She wants the community to decide that one of its values is helping the people affected. “The land shapes us as we shape the land.” This community has been good about helping in the past. She wants to formalize our response to slides similarly to how we respond to fires so that just as now when a fire threatens a home, we defend it. In the future, we do the same with mudslides. This entry was posted in Landslides and tagged Alderpoint Road, Dobbyn Creek, Kym Kemp, landslide, photos. Bookmark the permalink.